I found these pictures stashed in the photo library on the computer this week. Sadly and regrettably, I have to admit that Charlie's life as a baby is a blur. If I could have one "baby do-over", without a doubt, I would choose Charlie. On the flip side, today and yesterday he has been a terror. Yesterday, he took off with a neighbor boy and didn't tell me where he was going. I drove through the neighborhood yelling his name, calling almost every neighbor that has a child his age, and mass texting "Is Charlie at your house? Will you send him home so I can spank him? Thanks!" Today, he hung on my wood shutters, breaking each individual shutter slat off it's hinge. I had been thinking earlier this week, after finding these pictures, how my Charlie's baby life got swallowed up by older siblings, and the surprise pregnancy of little brother. And in selling and building a house. Gosh, if I could go back and do things over, I would take him out of his swing, or saucer, or bouncer and snuggled and loved that baby until the next one came. I would forget about house stuff. Let my dreams of granite counter tops and more square footage go. I would stagger nap times to allow for one on one time. I would take him on every mom and dad date just because. And then video tape every minute of his baby life. Let this be a lesson learned to pay more attention to the middle child. And maybe, he won't be so naughty. It's not too late you still have time and he is old enough to remember thew time you spend with him. If it makes you feel any better I remember coming over and taking Charlie out of his swing and walker to love him and carry him around. He is such a cute little boy. He isn't a NAUGHTY LITTLE BOY and when he is his cute little smile always works to get him out of trouble. I love Chars! and Max and Jack and you all. Look on the bright side... at least you have pictures of him. He wasn't totally forgot about. And thank you for the advice for when I have another one. oh little chars. love that little boy. i loved him calling down the hall, when i was visiting, jojo? jojo? and granny is right. it's not too late. he may not want to be cuddled as much as you want to cuddle him but do it anyway! I'm middle child. I turned out okay. Buhwah hah hah hah. 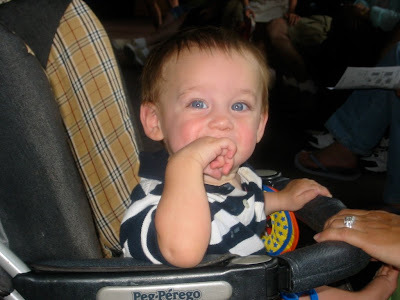 He was an adorable baby. It is so easy to say what we would go back and do differently but in the moment, it's really hard. You had to do the house stuff, and everything else and I'm sure he didn't suffer for it. He's just giving you a little payback now! good advice. and never too late to start! More snuggling, less granite. Here here!